We had the pleasure of hosting Mimi Casteel of Bethel Heights and Mark Vlossak of St. Innocent Winery this past Wednesday at SOHO as part of the High Museum Wine Auction week. Executive Chef Joe Ahn created a beautiful tasting menu and each course was paired with wine from both wineries. The result was pure art. 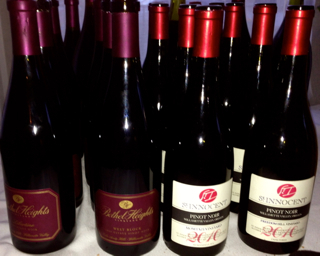 Miss Mimi Casteel presented wines that matched her elegance, and the wines from Mark Vlossak were as charismatic as he. Her Estate Chardonnay and Riesling met his Pinot Blanc and Pinot Gris, and together with their Pinot Noirs, they proudly showcased the extraordinary wines of Willamette Valley. They shared their extensive knowledge and love of winemaking, and we all came to appreciate the art of their craftsmanship. Chef Joe Ahn wooed diners with his deft ability to pair beautifully prepared dishes in a way that graciously showcased the wine. He succeeded from the first course of Butter Poached Georgia White Shrimp. The most perfectly prepared Smoked Wild King Salmon with Avocado Sauce followed, and by the time we tasted the third and fourth courses of Baby Rack of Lamb and Duck Confit designed to showcase the pinot noirs, even the vintners were dazzled by his artful presentation. I once read a review where graceful servers were compared to butterflies, in that you’re usually happy to see them and they never impede, and I was thrilled to host an event where our staff excelled in the art of service. Finally, the reason we were all gathered was to celebrate the High Museum of Art, known for its “steadily expanding permanent collection and innovative, exhibitions and programs.” My husband, Frank, reminded everyone of something I said when we first met 15 years ago: Unless you support the arts, you have no right to criticize the arts. It’s been a joy to watch the High Museum grow since I first arrived in Atlanta in the 1980’s. This past Wednesday, it was a joy to support the arts and experience an artful evening. For more than 1,000 years, the Irish have observed St. Patrick’s Day as a religious holiday; traditionally, by attending church in the morning and celebrating in the afternoon with food and drink. But, as is often the case, a story of pirates, slavery, bravery, religion, politics and sainthood has turned into a day of parades, feasting and green beer. We should keep some historical context of this religious holiday and the passionate immigrants who kept their family traditions alive. The disclaimer is, I am not Irish. Of course, the truth is, neither was St. Patrick. Born in Roman Brittany, sold into slavery at age 16 by pirates and brought to Ireland where he was forced to work as a shepherd, Patrick discovered his faith and found his calling. Upon his escape only a few years later, Patrick made his way back to his family determined to return to Ireland and bring Christianity to the pagans. But, I digress. I was born and raised in Syracuse, NY and went to a high school on the city’s west side in a neighborhood that reveled in its Irish heritage and boasted the only traffic light in the country with the green on top of the light. Yep. The traffic light at the corner of Milton Avenue and Tompkins Street on Tipperary Hill is upside down. Green, yellow then red. In the early part of the 1800’s, immigrants, many from County Tipperary, Ireland, played a large role in building the Erie Canal, and many settled in the neighborhood known as Tipperary Hill, close to the factories and salt mills that provided work for the Irish laborers. 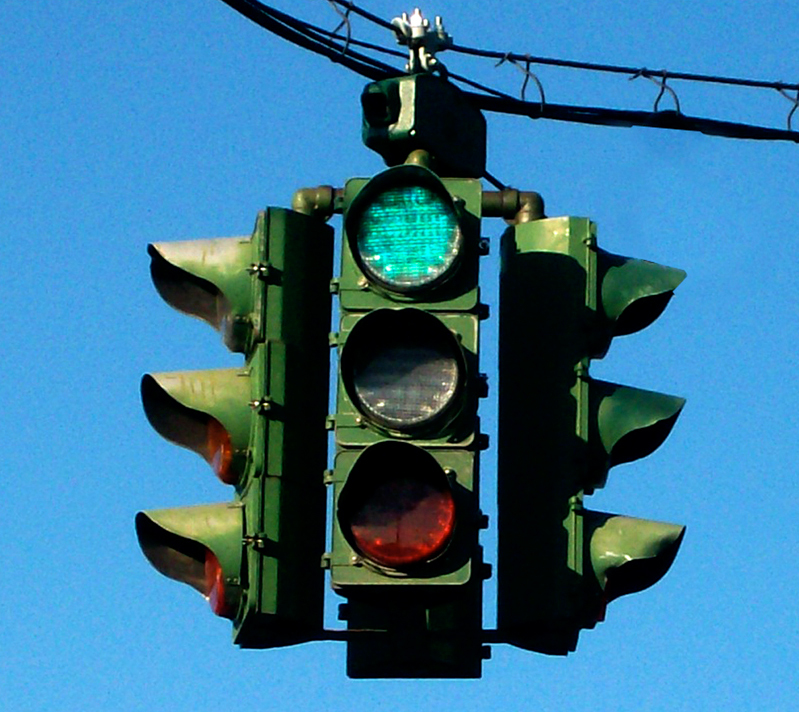 Local legend states that when traffic lights were installed in 1925, neighborhood Irish boys threw rocks at the red light to protest the color of British red dominating over the Irish green. Decades and many broken red lights later, the light’s colors were permanently reversed. It remains a great story of pride and tradition. Between sips of green beer and shots of Irish whiskey this St. Patricks Day, let us remember the extraordinary men and women of Irish decent who made the voyage to this great country, and although were treated less than favorably as immigrants, contributed greatly to this young country and to her many Irish neighborhoods. Indeed, THAT is worth celebrating with a beer. 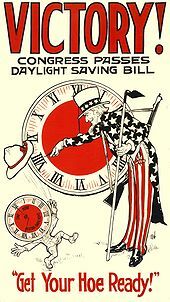 I had a friend once who struggled with Daylight Saving Time. Being a stickler for details, she’d remind people it was, in fact, Daylight Saving Time. Not Savings. Saving. Got it? She was extremely bright and capable, but she thought the “savings account” inference was wretchedly confusing. She wanted to understand where the hour went. After brief discussion, however, she’d let it go with a shrug. Maybe the German term “sommerzeit” would have made it easier. Simply translated, summer time, makes a bit more sense. Just like Eastern, Central or Mountain Time. E.D. and I lost touch after a while, but prior to the arrival of each new Spring, while setting my clocks ahead, I wonder how she is faring in her new life and wonder if she was ever able to reconcile the timekeeping aspect of sommerzeit. And it reminds me that whether springing forward or falling back, we should cherish the now and take a moment during our busy day to smile and smell the spring flowers, because time is precious, no matter how it’s measured. And after all, we’ll be falling back before you know it. I hope you enjoy your summer time! SOHO Atlanta Restaurant will finish a tour of Italian wines and flavors on flight night, Wednesday, June 29. First, SOHO will pour a 2009 Pra Soave Classico from Veneto. The Wine Advocate awarded the 2009 Pra Soave Classico 90 points. The review notes that the wine "opens with gorgeous aromatics that lead to crisp, beautifully articulated fruit. The persistence, balance and clean, minerally finish add up to an absolutely delicious bottle of Soave. Needless to say, it is highly recommended." Next, SOHO will pour a 2007 Frescobaldi Nipozzano Chianti Rufina Riserva from the Chianti Rufina DOCG. The wine was named one of the top 100 wines of 2010 by Wine Spectator magazine. On the nose, the Chianti Rufina Riserva offers solid fruit notes of wild blackberry, blueberry, rasberry and dark cherry, as well as spices such as sage, rosemary, vanilla and cinnamon. On the palate, the wine is spicy and harmonious. Finally, SOHO will pour a 2005 Cascina Chicco Nebbiolo Langhe from Piedmont. Nebbiolo is considered one of the great wine varities and is prized by collectors. The 2005 Cascina Chicco Nebbiolo is round and fruity on the palate, with cherry, plum, and earth flavors. SOHO's executive chef, Joe Ahn, has created three tapas plates to pair with each Italian wine. The following pairings will be featured on SOHO's menu until Wednesday, July 6. SOHO Atlanta restaurant will continue to showcase the wines and flavors of Italy on flight night, Wednesday, June 15. First, SOHO will pour a 2010 Tormaresca Chardonnay from Puglia. The Chardonnay offers notes of peach and citrus fruit. On the palate the wine is soft, with good acidity and a persistent finish. Next, SOHO will pour a 2007 La Vite Lucente from Tuscany. The Lucente is a blend of Merlot, Sangiovese and Cabernet. In his review, Robert Parker said of the Lucente, "a dark, sensual beauty graced with layers of expressive, perfumed fruit. Soft and generous on the palate, the wine offers notable length and an elegant finish framed by ripe, silky tannins." Finally, SOHO will pour a 2004 Podere San Giovanni Vino Nobile from Montepulciano. The wine is a blend of mostly Prugnolo Gentile with some Cannaiolo and Mammolo. It can only be produced in the "town of Montepulciano" and must be wood-aged for 18 months. The Vino Nobile offers flavors of black cherries, licorice, and smoke, and is well-balanced. SOHO's executive chef, Joe Ahn, has created three tapas plates to pair with each Italian wine. The following will be featured on SOHO's menu until Wednesday, June 22. SOHO Atlanta restaurant will spotlight the wines and flavors of Italy on flight night, Wednesday, June 8. First, SOHO will pour a 2010 Maretima Pinot Grigio from Veneto. On the nose, the wine offers scents of sage, lemon verbena, and green apple with hints of tropical fruit. On the plate the Pinot Grigio is medium-bodied with notes of fruit, walnut-husk and almond. Next, SOHO will pour a 2009 Zenato Valpolicella Classico from Vento. The wine is a blend of 85% Corvina, 10% Rodinella, and 5% Sangiovese. The Valpolicella Classico offers aromas of wild berries, currant, black cherry, spice and hints of chocolate. On the palate, the wine is dry and robust with a velvety texture. FInally, SOHO will pour a 2008 Vietti Nebbiola Perbacco from Piedmont. The Nebbiola offers flavors of generous fruit along with menthol, spices and hard candy. Round, soft tannins add to the long and refined finish. SOHO's executive chef, Joe Ahn, has created three tapas plates to complement each Italian wine. The following will be available on SOHO's menu until Wednesday, June 15. This June, SOHO Atlanta restaurant will showcase the wines and flavors of Italy. The Italian tour kicks off on flight night Wednesday, June 1. First, SOHO will pour a 2008 Disisa Grillo from Sicily. On the nose, the wine offers aromas of pear, Golden Delicious apple, and honeysuckle. On the palate, the Grillo is light, crisp, and balanced with fruit. It is a great warm weather wine. Next, SOHO will pour a 2008 Cardeto Rupestro from Umbria. The wine is a blend of 80% Merlot and 20% Sangiovese. On the palate the wine offers flavors of plums, cherries, and peppery spices. Finally, SOHO will pour a 2007 Antinori "Villa Antinori Red" from Tuscany. The Villa Antinori Red is a blend of 55% Sangiovese, 25% Cabernet, 15% Merlot and 5% Syrah. The wine offers aromas of ripe fruit, plum jam, mint, chocolate and tobacco. On the palate, the wine has good body with velvety tannins and hints of ripe fruit. SOHO's executive chef Joe Ahn has created tapas plates to pair with each Italian wine. The following will be available on SOHO's menu until Wednesday, June 8. SOHO Atlanta restaurant will finish a tour of Napa Valley wines and flavors on flight night, Wednesday, May, 25. First SOHO will pour a 2009 Antica Estate Chardonnay. On the nose, the Chardonnay offers flavors of crushed stone fruit. On the palate, the wine offers flavors of pear, apple, white peach and minerals. The Chardonnay is produced from grapes harvested from six distinct vineyards on the Antica Estate. Next, SOHO will pour a 2008 Steltzner Claret. The Claret is a blend of 68% Cabernet Sauvignon, 20% Merlot, and 12% Cabernet Franc. The wine offers notes of Bing cherries, cinnamon, clove, vanilla, and sweet oak on the nose. On the palate, the Steltzner Claret offers flavors of sweet dried cherries, baking spices, vanilla and cedar. Finally, SOHO will pour a 2007 Robert Mondavi Napa Cabernet Sauvingnon.The wine is a blend of 86% Cabernet Sauvignon, 8% merlot, 4% Cabernet Franc and 1% of Petit Verdot and Malbec. Grapes are sourced from both the To Kalon vineyard, best know for producing Opus One, and the Stags Leap District. The Cabernet offers notes of dark fruit, warm vanilla and star anise on the nose. On the palate, the wine offerrs flavors of huckleberry, blackberry and currant and has a long finish. SOHO's executive chef, Joe Ahn, has created three tapas plates to pair with each Napa Valley wine. The following will be offered on SOHO's menu until Wednesday, June 1. May is National Celiac Disease Awareness Month and, in conjunction with that campaign, SOHO would like to remind diners that the restaurant offers gluten-free dishes for both lunch and dinner. The entire gluten-free lunch and dinner menus can be found here. Signature SOHO appetizers that can be found on the gluten-free menu include: chicken tortilla soup, with pulled chicken, tortilla chips, avocado, tomatoes, corn, cheese, chili and lime; farm-raised Prince Edward Island mussels served with lemongrass and serrano white wine broth; and hanger steak tacos served with soft corn tortillas, tomatillo salsa, guacamole and sour cream. SOHO's also offers gluten-free diners numerous entree options on the lunch and dinner menu. The lunch menu includes: a noodle bowl with rice noodles, shrimp, chicken, bok choy, and Chinese five spice chicken broth; blackened mahi tacos with soft corn tortillas, spicy red cabbage and a citrus sauce; and a maple-glazed salmon salad with a key lime vinaigrette. The dinner menu includes: a grilled pork chop served with herb roasted potatoes, pear sauce and seasonal vegetables; a Scottish salmon glazed with Mayhew BBQ sauce served with roasted fingerlings and sauteed swiss chard; and Painted Hills beef short ribs served with celery root potato puree, sauteed spinach and tomato, and a natural reduction. For gluten-free diners looking to quench their thirst, SOHO does offer a gluten-free Tito's Vodka and Green's Amber Ale.